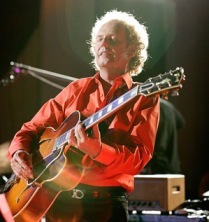 Lee Ritenour, born on 11 January 1952, has established himself as one of the world's leading jazz guitarists with a series of accessible albums over three decades. Starting at the age of 16, Ritenour played his first session with The Mama's and the Papa's. Two years later he was backing Tony Bennett and Lena Horne at L.A.'s Dorothy Chandler Pavilion. Know as "Captain Fingers," Ritenour became a sought-after session player in the mid-70's. Starting in 1976, at the age of 24, he began his own solo career which now includes over 30 albums and collaborations. Although heavily influenced in his early days by the relaxed styles of Wes Montgomery, Joe Pass and Barney Kessel, he now has his own distinctive sound and fluid style. His list of session work is awesome (some 3,000 sessions), but some of his notable performances were with Herbie Hancock, Steely Dan, Dizzy Gillespie, Sonny Rollins and Pink Floyd. Since the mid-80's Ritenour has been strongly influenced by Brazilian music.